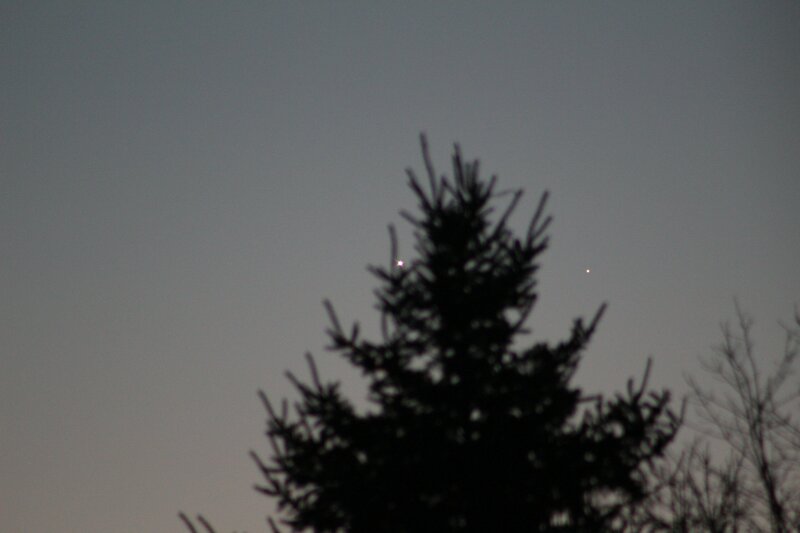 Last night, three days after the Toronto Ice Storm, Santa brought us astronomers a Christmas gift: Clear Skies! Therefore, I decided to take advantage of it. My goal for this session was to view a rare astronomical event: the occulation (blockage) of a star by an asteroid. The star was a 10.4 magnitude star (not very bright). The asteroid was a 15.4 magnitude asteroid (dimmer than the star). To see it is a slim to nil chance, but I tried. At 10:50 pm, I took my telescope out in the bitter cold and got it ready to view the stars in the snow. For the first time, I was able to align the telescope using the SkyAlign feature. In previous sessions, I failed to align the telescope using the SkyAlign feature. Yesterday, I succeeded in that. After aligning the telescope, I got the coordinates for the star in Ra/Dec and Alt/Az coordinates. When the telescope slewed to it, it was behind the trees. I had to readjust the telescope to view it away from the trees. When it came time, I looked into the telescope and I saw small stars. However, I don’t think I saw the star that was to be occulted. It was disappointing, but I wasn’t surprised. I was not prepared or experienced enough to find such a small and unknown object. I decided to move on to other objects on my list. I first slewed to the bright object in the sky, Jupiter. I saw the beautiful stripes, and its 4 beautiful moons. It’s always a sight to see Jupiter. I can check it off my list now. The next object I saw is Sirius. One fact about Sirius is that it is a double star system, with a star 2 times the size of the sun, and a white dwarf that already died. Looking at it myself, I saw the star, and I think I saw a bulge from one side of the star, which is probably Sirius B. I can’t be sure until I view it closer. I can now cross the constellation Canis Major off my list. The next objects I observed are the two brightest stars of Orion: Betelgeuse, and Rigel. I first slewed to Betelgeuse, the bright red supergiant. It was magnificent. I next slewed to Rigel. I had to move my telescope a bit, but I was able to find it. It wasn’t as bright as Betelgeuse though. I was able to cross of Orion off my list of constellations. I looked into the sky and saw a small cluster of stars, and I saw M45 also known as the Pleades, or the Seven Sisters. It is a star cluster that is visible to the naked eye, and is made up of 7 stars. I decided to look at it through the telescope. Doing that, I saw the magnificence of the 7 sisters in its formation. It was awe-inspiring. I crossed it off my list under the Deep Sky Objects Category. Remembering my previous session where I could not see the horsehead nebula due to the battery dying on my telescope, I decided to slew towards Orion’s sword, a collection of three stars that represent the sword of the mythological hunter, Orion. The vicinity of those stars are quite interesting. I see dim stars close together and in interesting patterns that one can’t see without a telescope. The most notable one that I saw was at the middle star. There I saw a dim green-tinted cloud of sorts in the sky. I have never seen that before, but I learned about it in the first few lecture videos in my Astronomy class. 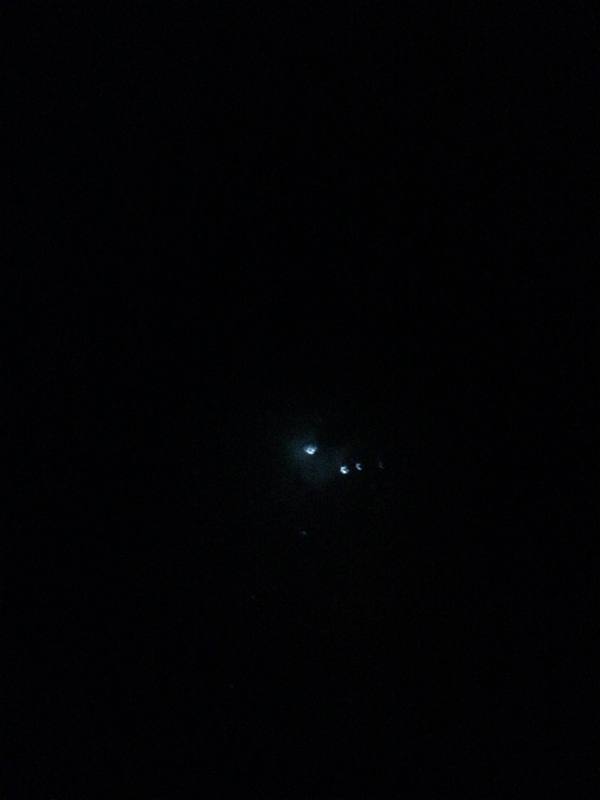 I believe I saw M42, otherwise known as the Orion Nebula. This was my first sighting of a nebula. I was very excited, and will explore further in the future. The Orion Nebula through my telescope imaged using an iPhone 5s. Continuing my journey, my telescope started to become sluggish and unresponsive, which lead me to conclude that the batteries died once more. With that, I decided to call it a day… but not before manually moving my telescope to the rising Waning Gibbous Moon through the trees. It was a very nice sight and another addition to my list. After that, I packed up my telescope and decided to call it a night. Overall, it was a very eye-opening experience. I tried to find a unique star event, however, I failed to find it. I was able to observe Jupiter, Sirius, Betelgeuse, Rigel, The Pleiades, the Orion Nebula, and the Waning Gibbous Moon. It was truly an interesting and productive night, which took me a step further in my astronomy adventure. I hope you will come with me.